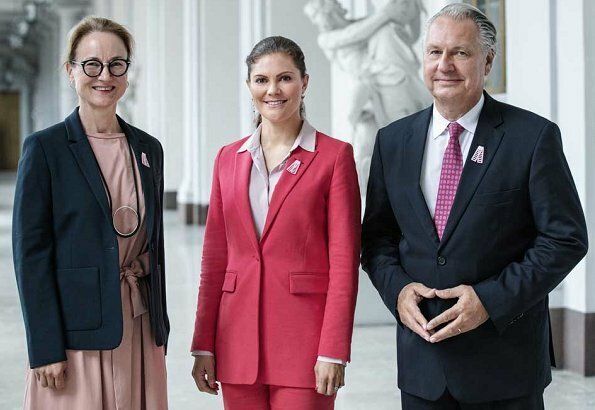 On September 11, 2018, Crown Princess Victoria of Sweden attended a meeting with representatives of Swedish Cancer Society (Cancerfonden) at Stockholm Royal Palace. The meeting was about 2018 Rosa Bandet Campaign. 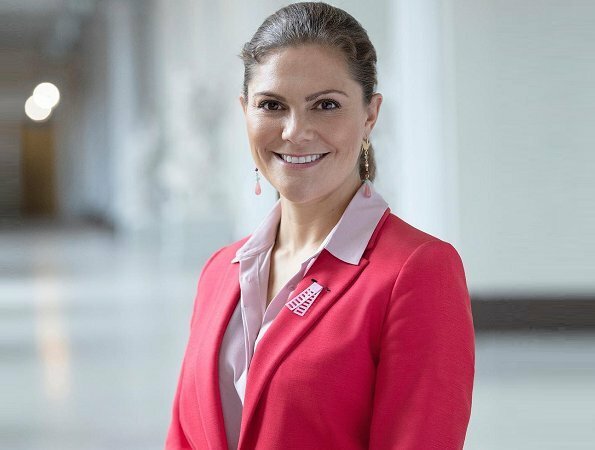 Crown Princess Victoria became the official patron of Pink Ribbon 2018 (Rosa Bandet 2018) Campaign of Swedish Cancer Association. The Pink Ribbon 2018 campaign will continue during October and it aims to struggle with breast cancer and raise awareness of the public about that disease by financing cancer researches. That first picture is a stunningly lovely photo of Crown Princess Victoria. Her suit fits beautifully and the color is excellent for her. I would only change from those stiletto shoes to some lower and more comfortable ones. It's just my taste - I think that kind of shoe goes with a dress, not slacks. I see that her hair is loose which is very flattering, too. Well done! Breast cancer is such a terrible thing - two former collegues of mine died. It is very good that Victoria supports the Rosa Bandet Campaign! 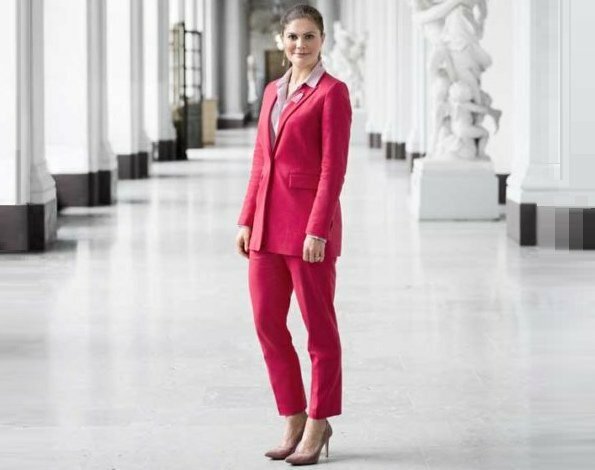 Victoria looks great in this suit.Love that she will be a Representative of the Swedish Cancer Society. Such an important cause. Thank you Victoria. This outfit is very flattering on Princess Victoria, especially on the first pic is lovely and sweet! I think ..I saw Victoria several times walking in slacks and do not yfeel comfortable ..then their is a video and V.is running with slacks in palace..
with very slim legs slacks are looking fantastic and otherwise.. Very important message she is sending. I am a 1-year breast cancer survivor and applaud her putting a spotlight on this disease. ATL - had I known this, I would never have written anything about the death of my collegues! Do not worry Coralie. These women were your friends and deserve to be mentioned, and remembered. ATL: Much Love and best wishes to you! My best wishes for you!!! I like the suit with this top and shoes way better than the first time (see last picture-with white top and black heels and purse). The colours are softer than the harsh contrast in the first combination. I don’t mind the stilettos in this colour. Still would like to see Victoria loosen up her hairdo a bit. At least it’s loose at the back. She seems a wonderful, kind lady, but her severe hairstyle sometimes makes her look anything but kind.